The Gotthard Base Tunnel (GBT; German: Gotthard-Basistunnel, Italian: Galleria di base del San Gottardo, Romansh: Tunnel da basa dal Son Gottard) is a railway tunnel in Switzerland. With a route length of 57.09 km (35.5 mi), it is the longest tunnel in the world. 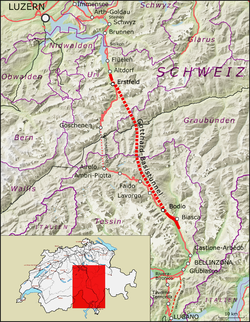 The link consists of two single-track tunnels connecting Erstfeld (Uri) with Bodio (Ticino) and passing below Sedrun (Graubünden). The main purpose of the Gotthard Base Tunnel is to increase local transport capacity through the Alpine barrier, especially for freight, notably on the Rotterdam–Basel–Genoa corridor, and more specifically to shift freight volumes from trucks to freight trains. This both significantly reduces the danger of fatal road crashes involving trucks, and reduces the environmental damage caused by heavy trucks. 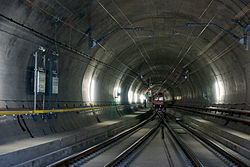 The tunnel provides a faster connection between the canton of Ticino and the rest of Switzerland, as well as between northern and southern Europe, cutting the Basel/Zurich–Lugano–Milan journey time for passenger trains by 1 hour (and from Lucerne to Bellinzona by 45 minutes). After 64 percent of Swiss voters accepted the NRLA project in a 1992 referendum, first preparatory and exploratory work began in 1996. The official start of construction began on 4 November 1999 at Amsteg. As of 1998, the total projected cost of the project was CHF 6.323 billion; as of December 2015, the final cost is projected as CHF 9.560 billion. This page was last changed on 24 December 2017, at 20:58.